In 2016, our Wrap & T.E.D Coordinator Ms. Shannon DeVos implemented a new summer camp program called, Trinity Trailblazers! This new camp for students entering Kindergarten through elementary school was originally offered to Trinity school and church members only. The program expanded in 2017 and accepted all community students due to an overwhelming enrollment response and positive feedback from current program members. 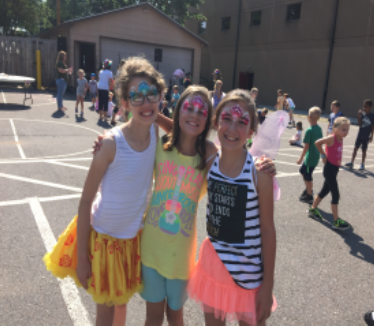 The Trailblazers Staff guide students in a variety of on-campus activities including bible and faith based lessons you would normally see at vacation bible school camps. “We want to teach the students to love and have compassion for others in all they do, just as Jesus did,” (Shannon DeVos). Their weekly schedule allows for off-campus field trips twice a week. Students have the opportunity to experience local businesses that create an impact on our community, as well as ventures into the Twin Cities to museums, parks, theaters and sporting events. Trips are also made to the Hudson Public library every other week so the students are able to continue their literacy/language skills year round by checking out library books! Trailblazers strive and understand the importance of giving back! Several activities are planned on/off campus for the students to engage with members of our community including visits to our East Campus, The Trinity Early Childhood Academy, and special interactions with the summer preschool children. Our program will start on June 17, 2019. For more information, please contact Ms. Shannon DeVos at sdevos@trinityhudson.org.